Old copies of the National Enquirer. An 8-Track Cassette Tape. Fruitcake. What do these things have in common? To paraphrase the Rolling Stones, you can’t always get you what you want during the holiday season. Sometimes, you don’t even get what you need. Getting a bad gift is never easy. That being said, the person who struck out with the gift in question likely wasn’t out to harm, humiliate or hurt you with their choice of present. Don’t trample their feelings! Here are some suggestions to help you accept any kind of gift. Don’t take gift questions as an annoyance; the giver-to-be wants to do right by you. But what if they go forth and shop for you without your knowledge? When you get the gift in question, you better not pout. A Yuletide gathering is not the time to whine, shout or show displeasure in any way. If you’re hostile to a gift you receive, what are you teaching the children around you about generosity and gratitude? It’s not positive. Write a Thank-You Note: It’s easy to blow this off. Don’t do it. “Oh, this is just a pair of slippers from my Grandma! I thanked her in person, even though they were two sizes too small! I don’t need to write a thank-you note!” should not be crossing your mind. If you dislike the gift, a thank-you note is necessary. If you need further tips on writing great thank-you notes, read “How to Write a Thank You Note” by the late Leslie Harpold. She raises an interesting hypothesis in the article: thank-you notes improve the gifts you recieve. So take pen to paper. Who knows what will happen next year? Keep This In Mind: In the long run, what you get during the holiday season is just stuff. 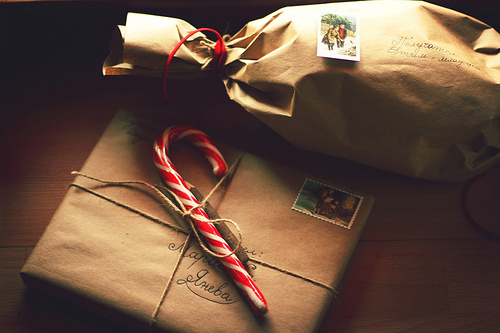 Holidays are about more than what you can score from Etsy. When you think back on Christmas 2010, my wish for you is not that you get good gifts, but that you remember and experience the true meaning behind the celebration; family, friends and faith. Stuff can be replaced. Memories can’t. this is the last how-to of the year. thank you so much for participating! i feel so happy that my little summer series idea grew into a weekly series, thanks to your awesome response. my goal was to give you an outlet to display your talents and special skills. i appreciate you sharing the stuff you know! i have enjoyed learning from you. please let me know if you'd be interested in seeing it in 2011. xo. how-to series archives for tons of tutorials from readers like you. Its always a great thing for ebay too...unwanted presents. i like this. and do feel bad, i think i gave a bad gift the other day. i think you should keep doing the series! I have really enjoyed the how-to series! Keep it up! i do enjoy your how-to series and wouldn't mind at all seeing it continue in the new year. This was one of my perfect posts of 2010. Thank you for the steady source of inspiration you provide here. I love your posts and your guest post series. Thank you again.